This post is sponsored by Simply Organic. The opinions and photos expressed are completely my own. 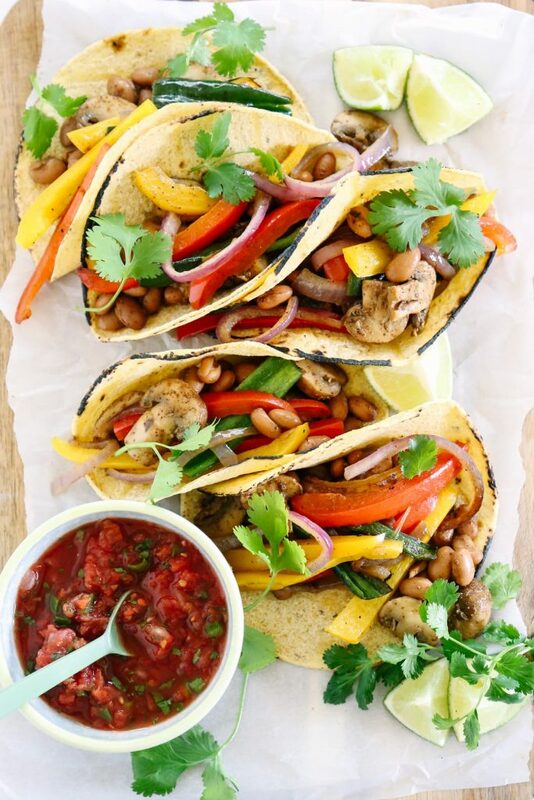 Thank you Simply Organic for helping me get the word out about real food, and adding amazing flavor with your spices to these vegetarian fajitas. The meal must be meaty (per Dustin). The meal must be kid-friendly, or at least presented in a visually-appealing manner (per Piper and Londyn). The meal must include veggies (per Kristin). 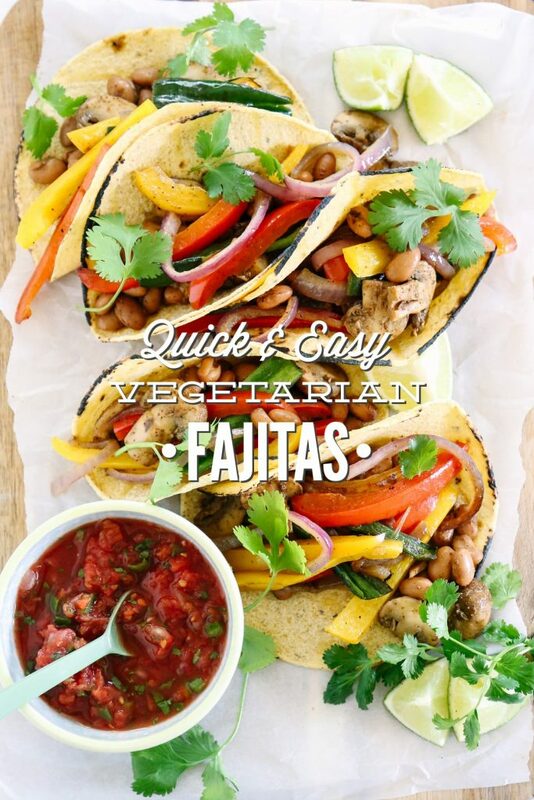 Enter Quick and Easy Vegetarian Fajitas. 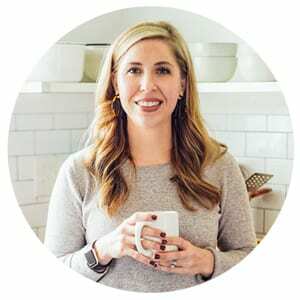 The over-achieving, simple meal that does it all: provides Dustin with a meaty fix, is visually appealing and fun to eat for the kids, and packs a ton of veggies into each bite for me. 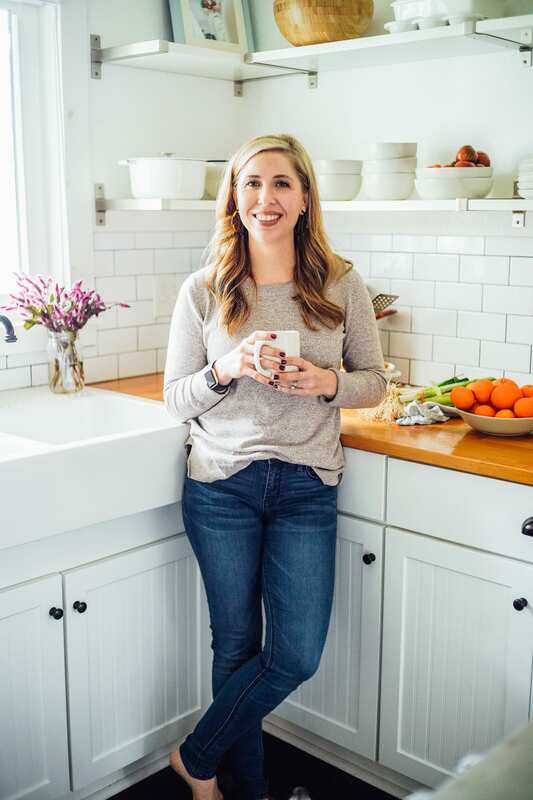 While this meal may be the ultimate real food overachiever, it’s also one of the easiest dinner recipes on my meal rotation. Vegetarian fajitas are generally the recipe that I turn to when we’re having an unexpected busy night, or I forgot to defrost the meat for a meal. 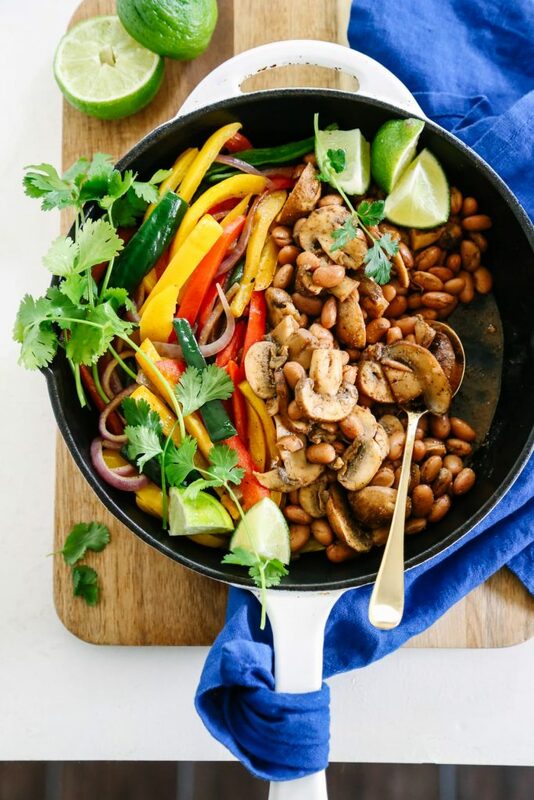 The simple ingredients (beans, mushrooms, peppers, spices, and tortillas) are always kept in stock in my fridge or pantry, so it’s easy to make our favorite vegetarian fajitas during a last minute dinner scramble. The kind of scramble that occurs at 4:30pm when you realize the hamburger meat is still frozen solid in the freezer, the kids are ravenously standing in front of an open fridge, and the hubby calls saying he’s starving and will be home in 15 minutes. 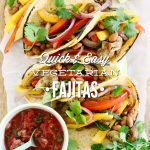 Vegetarian fajitas to the rescue! I know I’m probably not alone when it comes to the occasional dinner scramble, so let’s talk about the details of these fajitas, shall we? Vegetarian fajitas start with the meat of the dish, mushrooms. Wait, wait, meaty? Mushrooms? I know, calling mushrooms “meaty” may sound like a fraud, but trust me, mushrooms are basically like the meat of the plant world, in my humble food opinion. Mushrooms are filling, and, when sautéed with spices, they turn into the perfect meat substitute. 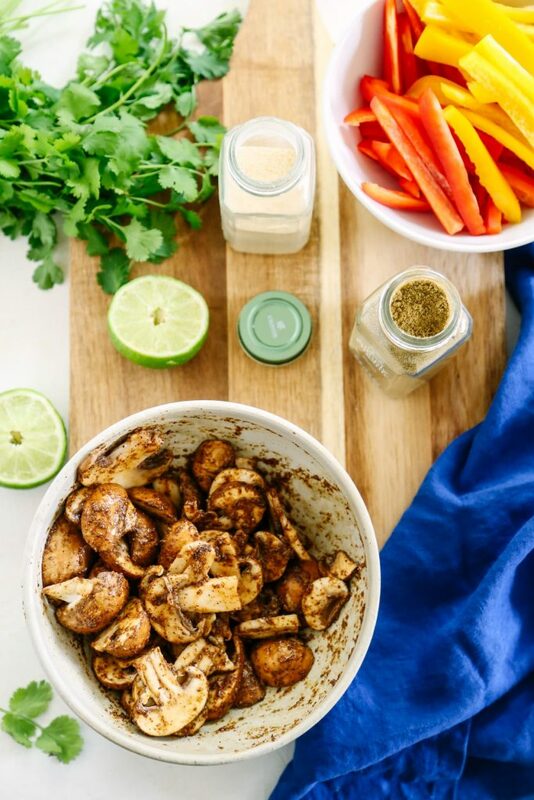 The mushrooms in our vegetarian fajitas are marinated for a few minutes in a blend of Simply Organic spices (cumin, chili powder, and garlic), along with lime juice and olive oil. To up the “meatiness” of our veggie fajita night, beans are later added to the mushrooms. A blend of peppers and onions are sliced and sautéed to complement the meaty mushrooms and beans. And finally, corn tortillas are warmed on our gas stove-top, directly over the open flame. The final result is a vegetarian meal that’s fun to assemble, can be made in less than 20 minutes without any prior prep work or planning, and appeals to the whole family! In a large bowl, whisk together the oil, lime juice, chili powder, cumin, garlic powder, and salt. 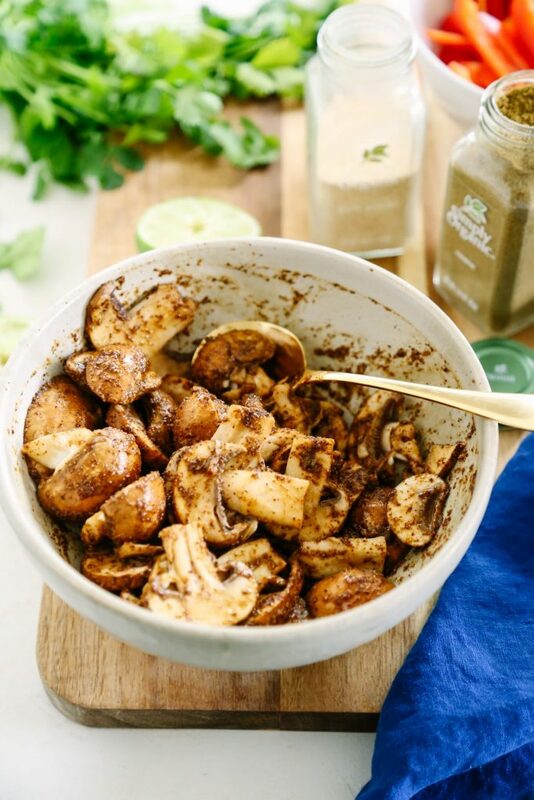 Add the sliced mushrooms to the bowl and gently toss the mushrooms in the marinade. 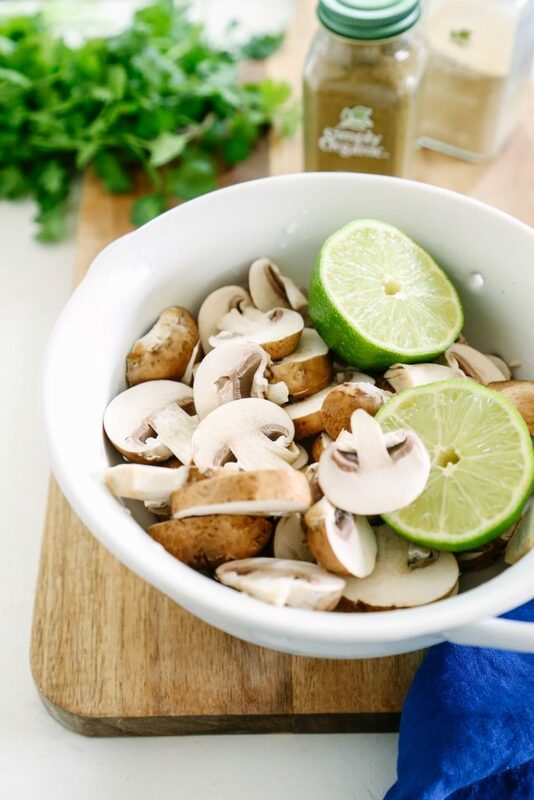 Set the bowl aside so the mushrooms can marinate at room temperature. In a skillet, over medium-high heat, warm the oil. Once the oil is warm, add the peppers and onions. Sprinkle the veggies with a pinch of salt to bring out their sweetness. Saute the veggies until they are soft and the onions are translucent, about 7-10 minutes. If the veggies stick to the skillet, add a bit more oil. Spoon the veggies onto a plate or bowl, and cover the veggies to keep them warm. In the same skillet, over high heat, add the mushrooms. Cook the mushrooms for about 7 minutes, until they are soft and brown. Finally, add the rinsed beans to the mushrooms. Gently stir the beans into the mushrooms to coat them in a bit of the mushroom "juice." Cook the beans and mushrooms for another 1-2 minutes, until the beans are warm. Taste the mushroom and bean mixture, and add a few pinches of salt for additional flavor, if needed. Serve the mushroom and bean mixture with the veggie filling over warm corn tortillas (or rice), with any additional serving options desired. PS: You can find a store coupon for Simply Organic's Spices, here. This recipe is a great base recipe with many variations, so play around with how you serve the actual recipe: fajita bowls with rice, traditional fajitas served with tortillas, or add the filling to a burrito. If you’d like to reduce the amount of time in the kitchen, slice the fajita veggie ingredients in advance. The peppers and onions will keep in an air-tight container in the fridge for about 3 days. If you’re serving the fajita filling over corn tortillas, I highly recommend warming the tortillas before serving the final dish. The flavor of corn tortillas really comes out when they are heated. To do this, I simply place the tortillas, one at a time, over a low flame on our gas stove-top, and let the tortillas sit on top of the flame for about 20 seconds (on both sides). If you don’t have a gas stove-top, I suggest warming the tortillas under the (low) broiler in your oven for a couple of minutes. These look delicious! I love fajitas, I’ll have to try this recipe! These were great! Everyone loved the mushroom mix. Awesome, Emily! I’m so glad everyone loved the fajitas! Absolutely wonderful! So easy, so delicious. My daughter who doesn’t like beans even thought it was the bomb. I doubled the recipe to use for leftovers later. The flavors will meld and be even tastier tomorrow or the next day. Next time when I double the recipe I’ll use 24oz. portobello mushrooms and 1 can of pinto beans, because the mushroom were fantastic!. Added some picante, a little guac, a generous squeeze of lime juice and it was amazing! You will not miss the meat. I’m so glad everyone loved these fajitas, Deb! Thank you for sharing!